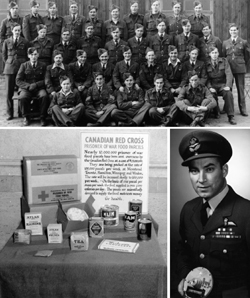 Clockwise from top: Flight sergeants imprisoned at Stalag VIII B prisoner-of-war camp pose for a photo; Flight Lieutenant Hubert Brooks; Canadian Red Cross parcels bound for prisoners of war. An article in the May/June issue described the adventures of aircrew who evaded capture after being shot down over enemy territory. In those situations, air force personnel often had an advantage over soldiers in that–having force-landed or bailed out–they usually had some time to organize their getaway. With escapes from PoW camps, however, soldiers, sailors and airmen started from the same point and had to get outside the camp and then make a clean break to freedom. These were difficult and rare accomplishments–to say the least. The first Canadian serviceman to escape captivity was Sapper Fraser P. Hutchinson of the 1st Field Company, Royal Canadian Engineers. He landed in France on June 8, 1940, as part of an advanced guard of 1st Canadian Division and was left behind, wounded and unconscious in hospital, when the Canadian troops turned about and headed back to England. Hutchinson was captured by the Germans but held in France, apparently in expectation of a British capitulation. In their efforts to get away, Escapers resorted to some spectacular tactics–some of them dismal failures. Warrant Officer James R. MacLeod of Springhill, N.S., became a PoW in January 1943 when his Spitfire was shot down over France. He was sent to Stalag Luft VIIIB at Lamsdorf in western Poland. In his first escape attempt, he and three comrades exchanged identities with soldiers to join a party engaged in manual labour outside the main camp. In October, they slipped out of the secondary compound, reached a German airfield, boarded an aircraft, but were recaptured before they could take off. MacLeod made two more unsuccessful attempts. Finally, on April 23, 1944, while other PoWs created a commotion at the far end of the camp, he and a comrade cut the compound wire, dashed into nearby woods, peeled off their uniforms and fled in civilian clothes worn beneath their battledress. They reached Switzerland the following month, crossing the border disguised as farmers carrying pitchforks. MacLeod was awarded a Distinguished Conduct Medal. He was not the only Canadian who tried unsuccessfully to steal an airplane, but he at least emerged alive. Hurricane pilots Howard P. Low of Vancouver and Russel Smith of Kamsack, Sask., having fled from Singapore, were taken prisoner in the Dutch East Indies in March 1942. On April 8, 1942, with a Royal Air Force officer, the two slipped away from their compound and reached an airfield. They boarded a plane, but managed to start only one engine before Japanese soldiers intervened. All three men were shot. Most escape stories are associated with flight from German hands in Europe, but Flying Officer Harold F. Marting’s tale was unusual in many ways. Born in Indiana, he had served with the United States Marines in Haiti before obtaining a private pilot license. Like many Americans, he joined the Royal Canadian Air Force in 1940. By June 1942 he was flying Kittyhawk fighters in North Africa, where he destroyed three enemy aircraft. On Oct. 24, 1942, he was himself shot down by flak and captured. On Oct. 26, following interrogation by Italian and German officers, he was flown to Athens, where he and several other PoWs were informed they would be sent to Germany on the 30th. Their escape prospects appeared bleak. On Oct. 29, while confined on the third floor of a hotel, he stole trousers and a cap from the duffle bag of a sleeping sentry and crept down the fire escape. Next, he scaled a 12-foot wall and then literally almost fell into the hands of Greek partisans. Marting was hidden until Dec. 12 when his helpers began moving him surreptitiously across land and water until he reached Turkey on the 17th. He was awarded a Military Cross–a decoration for an air force officer. He was repatriated to Canada and resigned his RCAF commission in June 1943. He became a civilian test pilot, but died in a crash in September 1943. That same fall, Allied PoWs in Italian camps were handed an opportunity to escape, then had it snatched away. When Italy signed an Armistice on Sept. 3, 1943, many PoWs expected swift liberation. Some officers told the men to remain in their camps until British or American troops arrived. These orders were naive and foolish; people could not expect the Germans to passively accept the Italian surrender and free the prisoners. German guards soon replaced Italian ones, and the inmates were evacuated to Germany. Among the more sceptical PoWs who did manage to escape was Flying Officer Jack F. Otten of Kingston, Ont., an air gunner who had been captured in March 1942 when his Wellington torpedo bomber was shot down in Greece. By December 1942, he had reached Campo 21, where he joined some 30 others in digging a tunnel. Excavations ceased with the Italian Armistice, and guards disappeared about Sept. 8, but the senior British officer told everyone to stay put, so they did. On Sept. 23, German soldiers appeared and began rounding up prisoners for movement by rail to Germany. Realizing that the operation would take more than a day, Otten and five others hastily gathered provisions. At 6 a.m. on Sept. 24 they were sealed in the abandoned tunnel workings; they waited until 4 p.m. on the 26th, dug their way back into the camp, and found it deserted save for one sentry at the main gate. They climbed the wire, split into two parties, and headed south, sleeping in barns and wearing civilian clothes provided by Italian farmers. Otten reached Allied lines on Oct. 13, 1943. Sergeant Charles E. McDonald of Shreveport, La., was another American volunteer in the RCAF. He earned his pilots wings in April 1941 and promptly went overseas. On Aug. 21, 1941, flying a Spitfire of No. 403 Squadron, he was shot down and captured near Lille, France. After medical treatment and detention in a holding camp he was sent to Stalag VIIIB, arriving about Sept. 24, 1941. Moved to Stalag Luft III in Sagan, McDonald concluded that he could never break out of that camp. He let it be known that he would do manual work for the enemy and secured a transfer back to Lamsdorf, where he was assigned to caring for gardens that supplied Luftwaffe messes. On Aug. 23, 1942, McDonald and three other prisoners climbed through a hole in the ceiling of their hut, reached a boiler room and unlocked it from the inside using a forged key. The perimeter fence itself was unlocked, and having evaded a guard they simply walked out and four days later were linked up with the Polish resistance. They were taken to Warsaw on Oct. 24, 1942, issued with identity cards and moved from location to location. McDonald was selected–along with two soldiers–to undertake an incredible odyssey that eventually led to an escape line to Gibraltar. He reached Liverpool on July 24, 1943, and that December was awarded the Military Medal. The story of Flight Lieutenant Hubert Brooks is one of the strangest epics in RCAF history. Born in Alberta, but living in Montreal when he enlisted, he trained as a navigator, joined No. 419 Sqdn. overseas, and was shot down on the night of April 8, 1942. His combat tour had been so brief that in 1945 his application for operational wings was turned down on the grounds he had “insufficient number of air operations against the enemy.” On learning that Brooks was a PoW, his sister declared he would be “too full of the devil for the Nazis to hold.” She was correct–in spades. Brooks had been injured as he landed by parachute and consequently failed in an evasion attempt. A week after being downed he was sent to Stalag VIIIB, the same camp where MacLeod and McDonald had gone. No sooner had he recovered than he made his first escape attempt. He managed to get outside the main camp by volunteering for a work party, then cut through barbed wire and, with another prisoner, sneaked past an area that was brilliantly lit and patrolled by dogs. They were at large for eight days–June 8-16, 1942–but were betrayed by Poles currying Nazi favours. Brooks returned to Lamsdorf, where he was punished with 14 days solitary confinement. Nevertheless, he managed to win another work party assignment, this time to a railway repair crew in the Sudetenland. On Sept. 10, 1942, he and five others escaped in pairs from the work barracks. They made it as far as Vienna, where they were discovered whilst hiding aboard a freight train. Brooks went back to Lamsdorf and another 14 days of solitary confinement. Incredibly, the Germans allowed him to join another working party, this one with a sawmill crew at Tost. However, he was carefully watched and warned that he would likely be shot if he tried again. He stockpiled chocolate and other articles from Red Cross parcels, and on May 10, 1943, in company with a British soldier, made his third escape, sawing through steel bars of their hut. They reached Czestochowa, Poland, on May 15 and contacted the Polish underground. Most escaped PoWs would have laid low and tried to get further away from the Germans. Brooks joined the partisans, and thereby risked summary execution if captured. He died in 1984, apparently without ever recounting his adventures, so the full story of his work with the Poles has never been revealed. It was undoubtedly heroic and dangerous. Fragmentary accounts state that by the autumn of 1943 he was commanding a Polish Home Army platoon near Krakow. A superior officer subsequently wrote: “Throughout the time he served as an officer with the Polish Home Army he showed great courage and outstanding ability as a leader. Brooks was responsible for selecting suitable landing grounds in the Nony Sacz, Myslenice and Bochnia areas for aircraft sent from Italy to Poland. He was also responsible for the security and welfare of 17 British and American soldiers and airmen who were under the protection of the Polish Home Army. His days on the run ended in January 1945 when Russian forces finally occupied the territory where he had been operating. He embarked at Odessa on March 7, 1945, and arrived in Britain on March 19. On Jan.1, 1946, he was Mentioned in Dispatches, and on Oct. 8, 1946, was awarded the Military Cross. The citation described his escapes, but made no mention of his work with the Polish Home Army. Indeed, Hubert Brooks’ career as a partisan had become rather embarrassing to the Canadian government. Late in 1945, the Polish government in exile, based in London, awarded him the Polish Cross of Valour and Polish Silver Cross of Merit with Swords. Normally, these would have been formally “gazetted” and announced in the London Gazette and Canada Gazette, but the Warsaw-based Polish government, which had been installed by the Soviets, objected, saying that they and not the London-based organization were the sole arbiters of Polish awards. The question of Hubert Brooks’ two Polish medals occupied RCAF and External Affairs minds until October 1947, when Air Vice-Marshal Hugh Campbell wrote that no gazetting should take place (thus giving Warsaw no grounds for complaint), but that Brooks should be allowed to wear the appropriate ribbons and medals–an “officially unofficial” solution that appears to have satisfied all. Brooks served in the postwar RCAF and was added to the RCAF Flyers hockey team to compete in the 1948 Olympics. With a 6-0-1 record, the Flyers defeated the Swiss team 3-0 to win Olympic gold. Two days later, Brooks married his Danish sweetheart, Birthe Grontved in St. Moritz, Austria, with Barbara Anne Scott (Olympic gold medal skater) as the maid of honour and Dr. Sandy Watson, coach of the Flyers as best man. Another RCAF escaper, Warrant Officer V. Bastable of Winnipeg, had a series of remarkable adventures. Shot down and captured in September 1942, he was sent to Stalag Luft 344 in the Sudetenland. He managed to arrange assignments to German work camps, from which he broke out of in May and October 1943, but on each occasion was recaptured within four days. By exchanging identities with a soldier with no escape record, he succeeded in getting to another work camp. From previous attempts he had formed a partnership with Sergeant Pavel Svoboda, a Czech who had escaped his homeland in 1939, joined the RAF, survived a North Sea ditching and was by then an old hand at breakout attempts. On Oct. 22, 1944, Bastable and Svoboda leaped from the roof of their billet over a barbed wire fence and ran to nearby woods where Czech partisans met them. They were guided to the eastern part of the country, but could get no further. Rather than passively lie low, they joined the resistance movement. They were well supplied with explosives and attacked railways, bridges and electrical installations. Late in April 1945, Bastable met Russian troops, but for a month he was treated as a prisoner rather than an ally. He finally reached England in June 1945 and was repatriated to Canada in July. A year later, he was awarded the Military Cross. This could have been a story with no happy ending–Bastable’s companion, caught in the act of sabotage, bearing arms and wearing a British uniform, would almost certainly have been executed. He had indeed been recaptured on April 14, 1945. Nevertheless, the brave Czech managed to bluff and buy time until April 23, when he escaped again, this time remaining at large during the final German collapse. After the war he had returned to his homeland, found Communist rule intolerable and fled to the West. Svoboda died in Britain on Jan. 8, 1993. Bastable was killed in a Vampire jet crash on March 27, 1949, probably never knowing that his friend had survived the war.